Whether you’re visiting New York City for the weekend or call NYC home, come join the largest Cleveland Browns Backers chapter in NYC at our official viewing site, Brother Jimmy’s Murray Hill. We’re also a Cavs bar in NYC during NBA playoffs / big games and a Cleveland Indians bar in NYC for playoff games. We have a massive private level at Brother Jimmy’s BBQ Murray Hill, with lots of seating, loads of standing room and our own bar. Our location is easy to get to with subway access from the 6 just a block away. Once you’ve arrived, just head down the steps to the basement level where you’ll enter our Cleveland safe-haven, with over 12 giant TVs & 2 massive projectors (only playing the Browns), a full bar and a team of dedicated waitresses. Lots of beers on tap and great BBQ all day long. 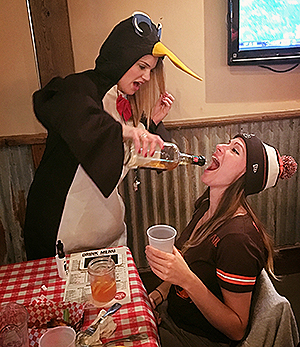 No reservations during the regular season for Browns games – so make sure you come early if you want a table. Don’t worry, there’s plenty of standing room by the bar with TVs all around you. Questions? You can shoot us an email or send us a message on our Facebook Page and we’ll get back to you ASAP. Follow us on Facebook, Instagram and Twitter. We won’t spam you with nonsense, but it’s the best way to stay informed about watch-party announcements and the occasional dank meme. For those interested, you can officially join our chapter. It takes 5 mins, is 100% free and helps us gain recognition from the Browns organization. Ding dong, the witch is dead. Hue Jackson out as Cleveland Browns head coach.